We certainly know how to entertain. Jan and Pat joined us for dinner and we had an unexpected arrival at the same time, the propane barge. It is quite a sight. 150 feet of diesel, gas and propane charging up the dusk enveloped channel and heading for our beachfront with a bone in it’s teeth (frothy bow wave to all you landlubbers). Captain Tom and crew were coming and were ready to pump! It was time for our semi annual fill and top-up. With his usual deft touch, Tom droped the thirty foot wide steel ramp and ran it up the inclined rocks to within a foot of our deck stairs and then left the helm to the GPS and stepped out to greet us while Lorne and Bob dragged the heavy hoses to our waiting tanks. It’s a funny relationship, unusual mostly – we are very fond of the crew (incredibly cheerful and dependable) and yet, we encounter one another for only about fifteen minutes twice a year. In theory, it is all business but, in reality, it is a warm, friendly encounter with people you like and trust and, admittedly, on whom you are somewhat reliant. They don`t need us to be there when they arrive as they know what to do better than we do but we always try to be there simply because we like to see them. If it is mostly business, it is the kind I like. 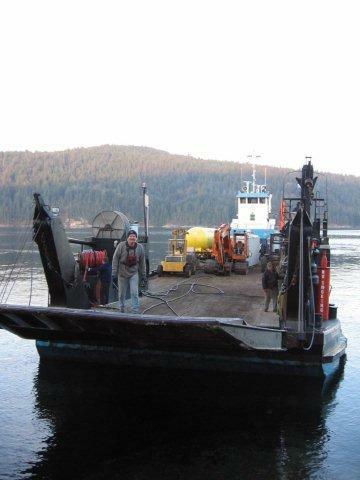 We go through about 1600 pounds of propane a year, 160 gallons of gasoline (for the boats) and a diminishing amount of diesel but still running at about 30-50 gallons a year (for the genset). We, maybe, spend as much as $3000 a year on fossil fuels counting in the limited amount of car driving we do (as little as 100km a month most months). I am working on getting all that down but, realistically, there is not much in the way of replacement for propane. At least not if you want it delivered by barge. And, you do. Omygawd, you do! We carry enough weights around. We load and unload all sorts of goods in town or enroute. Food, lumber, parts, merchandise, wine, etc. Sometimes we tow our little utility trailer if the the load is too much for the Nissan Pathfinder’s volume, such as it is. And, when we do a Costco run (about twice a year), it is often too much for the Pathfinder. When we get to the furthest land disembarkation point, we have to schlep it all down the end-of-the-road hill to the boat dock. Well, we used to. After the community resurfaced the last 150 feet of 25 degree dirt and gravel slope, we managed to make it sufficiently passable for 4wd SUVs and trucks. We can now cover the hardest distance in relative comfort. There is still the beach to navigate but, comparatively, it is much better. Those without 4wd still schlep. Then we load it into the boat, ferry it to our front beach and then schlep it up from the shore over irregular rocks, barnacles and seaweed to the lower deck where we can then load it on to the funicular. That distance is the soul-breaker. I am slowly extending the funicular to the low-tide mark but it requires learning how to weld and that course requires an as yet unaquired welder so progress has been a bit slow. Sal`s plate is pretty full and her welding lessons have had to wait. The hardest load used to be propane and fuel. A five gallon container of fuel weighs 50 pounds and, with the irregular and slippery surface, it was actually a bit easier to at least get the load balanced by carrying two. That`s a hundred pounds. And Sal can only do that so many times. Propane is even harder for her because the tanks cut into her little hands. And the large cooler full of frozen food is a monster that weighs what she does. I sometimes help so it’s not so bad. But she has been slowing down some lately. And yelling at her just doesn`t seem to help. She just goes slower. I think I am going to have to move that lower funicular up the agenda. Better end this. I still have to find the extra-strength rat poison from our last trip (where could it have gone?) and Sal just made breakfast. Promptly, too, I might add. What a gal!